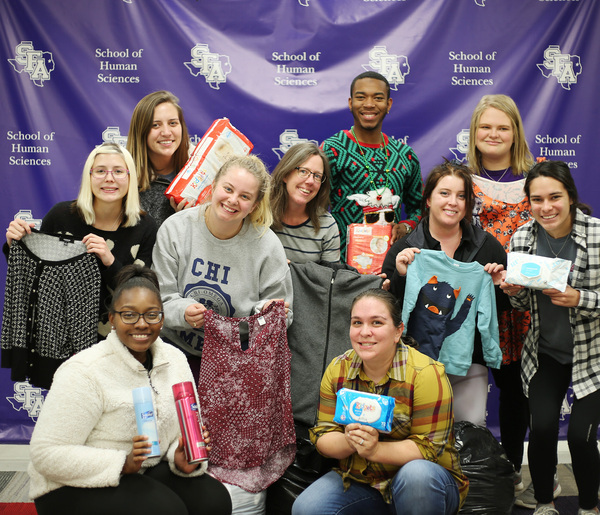 Stephen F. Austin State University student members of Phi Upsilon Omicron, a family and consumer sciences scholastic honor society, are accepting donations of baby items, toiletries, and gently used women and children's clothing. Each year the honor society hosts a professional project, and this year the group's project title is "Shining a Light on Those in Need." "We are providing services to those in need in our community," said Dr. Jennifer Newquist, SFA assistant professor of human sciences and Phi Upsilon Omicron advisor. "The purpose of professionals in our field is to advance family and consumer sciences, enhance leadership and encourage commitment to the field by employing professional knowledge while serving others." The students will deliver the donations to the Family Crisis Center of East Texas. To donate, bring items to the Human Sciences North Building, Room 115, on the university's campus. For more information, contact Newquist at (936) 468-1082 or newquistj1@sfasu.edu.